A Sweex WC066 webcam was placed at the prime focus of an f/5.5, 80mm, ED refractor. 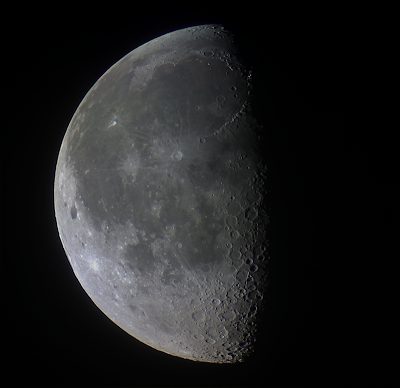 AstroDMx Capture for Linux was used to capture two overlapping SER files of the Moon. The SER files were stacked in Autostakkert! 2.6, running in wine and the resulting images were stitched together using ICE in Wine. The final image was processed in the Gimp 2.9. Click on the image to get a closer view. This webcam delivers a remarkably uncompressed video stream in YUYV format, so is suitable for solar system imaging. However, the burden of this device is that its initialising on the USB bus is inconsistent whatever the platform being used. However, with patience, it is a pleasing camera to use.